Okay this is a wikipedia page so it already gets significant lift in the rankings. But they also do some interesting things on the page to work in the keywords. This page is the first one I have recently reviewed which has exceeded the keyword frequency usage of 4%. The page also includes the keywords in the links where few pages do and the body prominence of the keywords is good. So what could tip this over to the top 10? 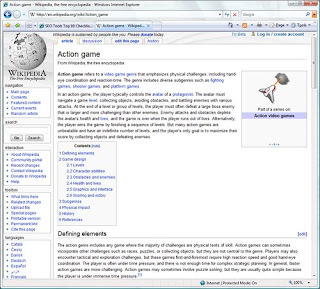 Well, I would first suggest that the title bar be changed to read Action games as well as the other references to just Action game. Really I think people would search for action games anyway rather than the singular action game. If you do search for action game then you will find this page in the top 10! Use consistent tense with your keywords based on how people will be looking for your page.